Valley Tiles, Angle Ridges and Hip Ends. 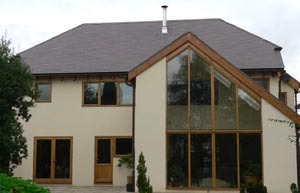 Dreadnought tiles have been used on many self build projects over the years but never on such an authentic self build as this one. Peter and Jenny Marston can claim to be genuine amateurs in building terms and yet with only some occasional help from their children they have designed and built this house virtually unaided. Not only have they produced a house displaying a high standard of workmanship but have tackled tasks that would tax the most accomplished tradesman. Even more remarkable is their embracing of so much innovative and environmentally friendly technology. It is a true lesson in what can be achieved with determination and enthusiasm. 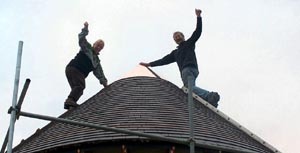 This is not a case of an untrained couple dropping interlocking tiles on a simple gable to gable roof but a totally committed husband and wife seeking advice and then working at height sometimes in winter and executing complex roofing details that would tax the skills of a hardy professional roofer. The Marstons demolished the existing house which was roofed with traditional Rosemary Staffordshire Blue Plain tiles but these have not been available since the Rosemary Cannock factory closed in 1992. They wanted genuine blue tiles and Dreadnought Staffordshire Blue Plain clay tiles were the perfect alternative. 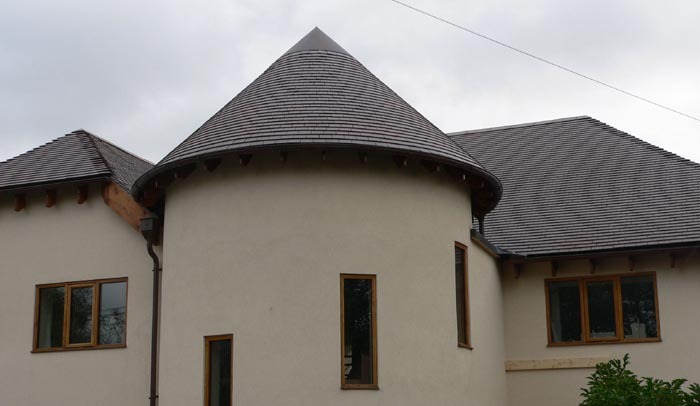 The Marstons always wanted to build a house with a conical tower and they were more than up to the challenge and mastered all the tiling details themselves. The roof is the highlight of the exterior of the building. The only professional help they sought was from an architect to get their plans passed by Building Control. "Our objective was to build a house which is environmentally friendly to run and comfortable to live in and capable of being built by us without professional assistance" commented Jenny Marston. "We are very pleased with the results". Dreadnought Works, Pensnett, Brierley Hill, West Midlands DY5 4TH.